What can you expect from a professional cleaning service? Here are a few things you might want to know about your cleaning service. How do I get an accurate estimate? Call or email us to schedule an appointment. We’ll come to your location to discuss your particular cleaning needs. Your estimate will be based upon the size of the area and frequency and type of cleaning, and any special requests. We endeavor to maintain continuity with our cleaning staff while balancing the need to maintain an efficient working environment. Our rates are reasonable and competitive, and based upon your particular needs. For a free estimate, call us at 423-307-3549 or contact us using our online form. How frequent are the cleanings? You can opt for one-time or regular cleanings. We offer basic cleaning for daily, weekly, bi-weekly and monthly residential and commercial clients. Do I give you a key? For your convenience, you may choose to give us a key so we can perform the cleaning while you are away. Alternately, you may choose to be there to let us in each time. We keep client keys under lock and key for your peace of mind. What do I do with my pets on cleaning day? We love pets and don’t mind them being around while we clean. If your pet is hostile though, we ask that they be restrained during the cleaning service. Do I need to be there when your team arrives? Basically, no. If you have given us your key, we can let ourselves in and we will lock the house when we leave. The first time we clean, however, it may be helpful for you to be there to let us in and help us familiarize ourselves with your surroundings. We take great care during cleaning, but sometimes things just happen. If something is damaged during our cleaning service, we will do our best to repair or replace the damaged item. Please contact us immediately if you find something amiss after a cleaning. What if you miss a spot? If you find that we have missed something and contact us within 24 hours of the cleaning, we will return and make it right if warranted. We value our customers and want you to be happy. We can use your supplies if you choose; just leave them out for us. Please tell us about any special cleaning instructions when we discuss the initial estimate. If you wish, we can use our own cleaning supplies. Should I do anything before a cleaning service? Do you have clean up before the cleaning service? That’s a great question. We ask that you clear any surfaces that you want cleaned including floors, tabletops and counters. It’s a great motivation to get stuff put away. Otherwise, we’ll either work around items left out or try to leave them in orderly condition. Do you offer ‘green cleaning’? Yes we do. Upon request, we will use cleaning supplies that are low in phosphates and other toxins, or we’ll use products you supply. 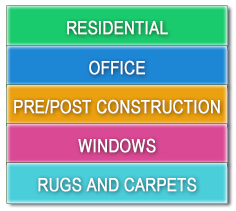 For residential clients, we ask that services be paid for on the day the service is performed. Most clients simply leave a check on the counter. We also accept credit or debit card payments. Regular commercial clients may opt to pay us on a monthly basis. We carefully screen our staff so we can offer you the best, skilled staff in the area. We are fully licensed and insured and only provide you with trained, experienced and professional employees. In addition, our employees are uniformed and smoke-free.